→ Review → Hosting → iPage Review 2019: Cheapest Way to Start A Blog? iPage Review 2019: Cheapest Way to Start A Blog? There’s a blogging myth which is stopping masses from starting a blog. Starting a self-hosted WordPress blog is costly. If you think the same, please stop right there. In this post, I’ll show you how you can start a blog for just $1.99/mo with a good web host and get yourself started in less than 10 minutes. The web hosting service I’m talking about is iPage. It won’t be wrong to say that iPage provide cheapest web hosting service which starts at only $1.99/month with a free domain name + unlimited sites allowed. iPage is a well-known web hosting provider dominating the rivals to provide budget web hosting services to all. iPage has been in business for the past 19 years, and they have proved to be a reliable web hosting service for beginners who want to start a personal blog without spending too much on hosting. I have put it this review to help new bloggers who want to start a blog but have an insufficient budget. I hope you’ll find it helpful. I am writing this iPage hosting review after using it for around 3 months and based on my personal experience. I was hosting a low traffic site with only 100-200 visitors per day, and hence the results were good for me. There are tons of features offered by iPage which makes them irresistible, but I’ll share only the necessary ones who actually matter. As stated earlier, iPage is one of the most budget-friendly web hosting provider which lets you start a blog for as low as $1.99/month with a free domain name. However, the price of $1.99/month is only valid when you buy for 3 years of web hosting from iPage with a total cost of $72. If you want to buy for 12 months only, then you’ll have to pay around $36. You’ll get a free domain name for the first year after which you’ll have to renew the domain at a fixed price of $14.99/year. If we look into the competitors, BlueHost charges a whopping amount of $196 for 3 years web hosting of its ‘Plus’ package. On the other hand, SiteGround charges $287 for 3 years of web hosting plan. Now, I know there’s a significant difference between the quality of iPage vs. BlueHost and SiteGround, but still, if you want to start a blog on a budget – iPage is a great option. One of the major concern about cheap web hosting is the uptime issue your site may face in the long run. Everyone wants their website to stay live 24×7 and do not crash or went down in case of traffic increase or other technical problems. Surprisingly, with iPage you won’t have to worry about the uptime of your site as in my testing, I found iPage to provide an amazing 99.95% uptime. Note that, my site was a medium traffic site which has only 20-25 articles and daily traffic of 100-200 visitors. As you can observe, the uptime for my site was 99.95% for the last 30 days. However, for the last 7 days and 24 hours, it was standing high at 100%. There’s nothing much I can expect for the price I’m paying. Customer support is a deciding factor for the quality of any web host. Unwanted situations like website crash, data lost, website hacking could occur anytime and customer support is the only hope at that moment. iPage claims to provide 24*7 phone, email, & live chat help support. Also, the staff is knowledgeable and prompt to help you with every issue you may face. Below is a screenshot of my live chat discussion with one of the executive. I was asking him if they provide a service of migrating my existing WordPress site from another host to iPage. As you can see, the response was quick and to the point. Things could go south sometimes, and in that case, you may have to stress on a certain part of problems. Their customer support definitely doesn’t look like an expert technical team, but yes they do take care of basic technical problems. For some of the cheap web hosting services, installing WordPress (or any other CMS) might be tricky. While most of the hosting sites are using CPanel to make the installation super fast. 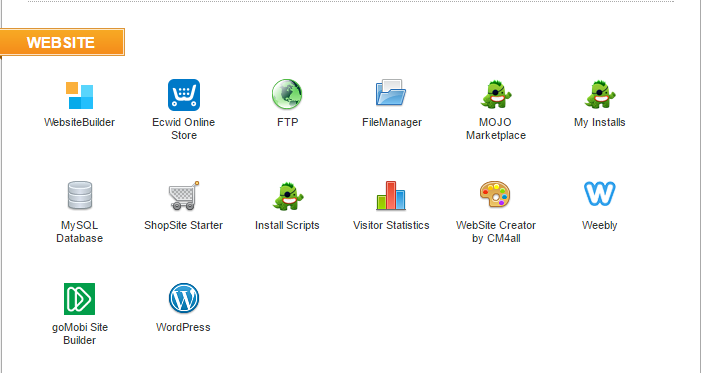 iPage on the other side, do not use CPanel but their own lookalike customized panel to help you with the installation. You can install WordPress with a single click from your panel and take your website to live in less than 10 minutes. iPage has also implemented MOJO Marketplace which is a friendly tool that lets you choose from 100+ ready to install scripts and install on your domain with a one-click installer. Some popular scripts/applications include WordPress, Joomla, Drupal, Backdrop, and Weebly. iPage itself is very affordable but it provides many freebies which makes it even more irresistible to buy. If you’re a small business and want to reach to customers with a minimal budget, then these credits will help you a lot. 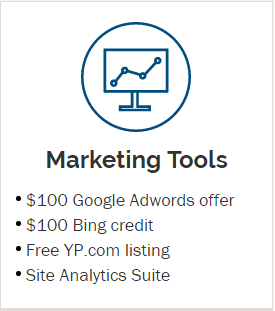 And with Yellowpages.com listing, your business will get an instant boost and will be indexed by Search Engines instantly. 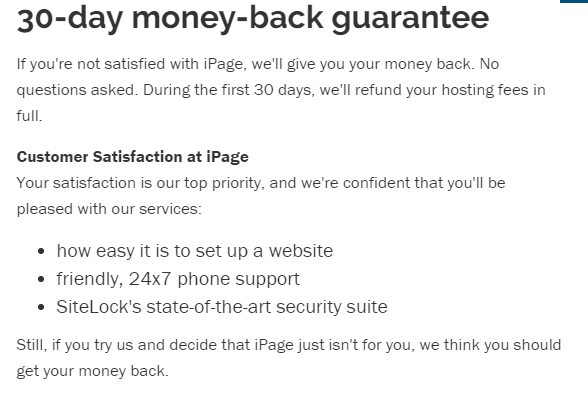 And the last important feature of iPage (or any other reliable host) is the money back guarantee. Like most of the web host companies, iPage also provide a 30-Day money-back guarantee with no questions asked. Note: Domain name is non-refundable i.e. If you opt for a refund within first 30 days of usage and have registered a free domain name with iPage then you’ll have to pay $15 fee for the domain. Finally, allow me to quickly summarize the review of iPage web hosting by stating what are the features we love and what we don’t. If You’re New to Blogging with a minimal budget and want to start low traffic or personal website, then iPage is a great option for you. Ever tried iPage? What are your thoughts about it? Do share your experiences and iPage review in the comment section below. Also, share this post with your friends and followers and help them start a blog for the lowest price. iPage is among the cheapest web hosting providers but it necessarily needs not be the worst! It is recommended by some top bloggers like Matthew Woodward, and for beginners who want to learn what having a blog feels, iPage is a perfect choice. The pricing is great, you can host multiple sites, installing WordPress (or other apps) is a click away, and you get a free domain as well. However, be attentive while ordering their service, as they’re known for upselling and avoid auto-payments from your credit cards. Thanks for the amazing words Aayush. One of the best posts I’ve read till now,Thanks for this useful post.